Precision Nickel Titanium arches with the anterior pre-torqued to 20°. Introduce torque early in upper centrals and laterals! Easy handling and placement of crimpable tube stops on archwires! SCORE® Assemblies are easily gripped disposable holders pre-loaded with crimpable tube stops. The clinician easily threads the tube stop onto the wire, slides it in the precise position desired, releases the holder with a slight pivot, and crimps. Easy! Color - coded holders are pre-loaded with either a Small or Large crimpable tube stop. • Tube stops are fully annealed 304SS 2mm long. • Holders are medical grade polycarbonate. • SCORE Assemblies are sterilizable by steam autoclave. • Flip-top boxes allow for easy dispensing. 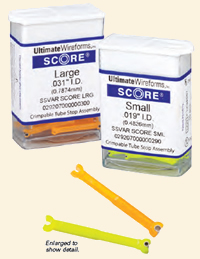 SCORE® Assembly Sizes: Small Recommended for round .012” through .018” wire. Square wires up to a max. of .020”x .020”. Rectangle wires from .014”x .025” to max. of .019”x .025”. Ten SCORE Assemblies are packaged, all one size, in clear plastic flip-top boxes. Sold in units of boxes. Custom Packaging See Custom Packaging section.